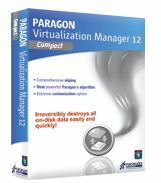 Get Paragon Virtualization Manager 12 Compact for free. Enjoy the benefits of virtualization without being too technical and for free! Continue using your PC’s applications in a virtual environment. Programs, files and user settings are transferred automatically with zero user downtime. Even if you moved from PC to Mac – you can continue using your Windows PC on your new Mac.